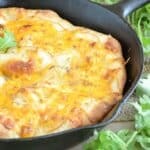 Pizza dough skillet bread is really easy to make. Just place fresh pizza dough into a skillet and I like to top it with cheddar and apples for a twist. Pizza Bread is a focaccia-style bread made from pizza dough and baked in a skillet. The brilliant thing about it is that you can use any pizza dough: Your own homemade stuff using this delicious recipe for Homemade Pizza Dough, the balls of fresh dough sold in some grocery store delis or even the rectangles of dough that come in a tube from Pillsbury. My preference is Homemade > Deli Dough > Tubes. But, it’s all good so give it a try with whatever you can get your hands on. I usually have pizza dough laying around to make garlic knots, so I find myself whipping up this skillet bread when I need to switch things up. The amazing thing about cooking pizza dough in a skillet is that you can cook it with or without toppings. Basically, pizza dough is a kind of bread dough, so if you don’t load it with pizza toppings, you instead get an easy bread. My favorite way to top skillet pizza dough is with cheddar, apples and a little bit of fennel seed. It’s a bit unexpected and incredibly delicious. Of course, you could use pizza sauce and cheese. Throw in some pepperoni if you like. Or get really creative – figs and goat cheese would be a blast, too. Any of your favorite seasonings or cheese will work. I hope you love this cheddar apple pizza bread recipe. If making homemade pizza dough, make this first and let proof (or rise) until double then punch down. Continue with steps below. Pour 1 teaspoon of the oil into a 10 inch cast iron (or oven-safe non-stick) skillet. Use your fingers to rub the oil all over the bottom and up the sides of the skillet. Center the rectangle of dough over the skillet and then allow the middle to sink in. Fold the corners in towards the center, squishing the dough until it fits. Brush the top of the dough with another teaspoon of olive oil. Lay the apple slices in a single overlapping layer on top of the dough. Brush the tops of the slices with the final teaspoon of olive oil. Sprinkle on the cheddar followed by the fennel seeds and the sea salt. Bake for 15-19 minutes, until the top and bottom of the bread, are golden brown and the cheese has become dark and a bit crunchy is a few spots. 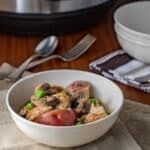 This recipe was published in March 2012 and was updated in April 2019. Glad to enjoyed your time at the forum and were able to make new and renewed connections. This pizza bread sounds lovely. I like your fruit and cheese one shown here and Katie’s savory one would be delicious too. Your story was a great recap of the forum at Disney. Your pizza bread sounds delicious. Great picture. Sounds way, way too fun. Hope they have something like that in Canada really soon. If you contact them and are willing to be an organizer, I’d bet they’d do one up there. They’re looking for places to go! Hey, if it’s there, I’d even travel North for it!!! So great meeting you too. And thanks for the Quinoa! I have been looking for a cast iron skillet,just that size, Pizza Bread size, since that pizza bread last fall. What an impression that one dish has made for us. Thanks. And I’m MISS you and my Florida Foodie life! Thanks for keeping it alive (for me) in your blogs, tweets and FB. Now back to that recipe! and where did you get that CIS? Christine you are way too kind. I’m so glad I finally got to meet your family at Food Blog Forum, and of course hang out with you all weekend!!! I’m so incredibly grateful that you shared your pizza bread recipe with a few of us last fall. It’s honestly changed my life, and I’m glad we are sharing it with the world today! I’m excited to be sharing it too. And I’m excited that you loved it so much. I can’t get over how delicious the combo of parmesan, rosemary and a touch of red pepper flakes sounds. I will be trying that soon!